It’s five days before the winter solstice. I went out to French Cabin Creek this afternoon. The sky was as gray as the inside of my wool sock drawer. 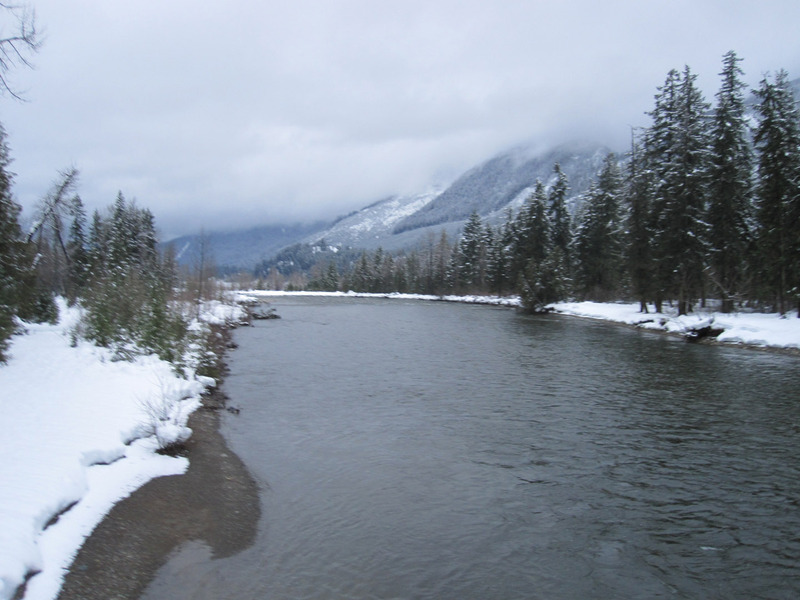 I carried my snowshoes across the bridge and looked down at the Cle Elum River. It was apparent that somebody had hauled a piece of a salmon carcass out of the river and perched on the snow berm to eat it. The evidence was visual and olfactory. Snowshoes go on with familiar movements–step in, pull straps. Climb up onto the snow from the plowed area and feel the snowpack. Hm. There’s a little bit of fluff on top of a rain crust. My weight breaks through the crust and sinks a little way down into a fairly firm mass. Not too bad. I pick a route through the trees toward the river. Here a squirrel has bounded through the snow. I see where an elk has made deep holes while walking to browse. The ends of the vine maple are freshly bitten. There is a snarl of snowshoe hare tracks in an alder thicket. When I reach the river, I stand on the snowbank above the water. A strip of rounded cobbles remains between the snow and the current. The sound of water feels large in the snowy stillness. A kingfisher wings silently upstream. It is enough to be there, witnessing the low light, the river, and the feel of mountains hidden in clouds. As dusk sinks in, I watch a bald eagle cruising across the valley. A more-than-half moon appears fuzzily in the east. It’s growing dark, and I make my way back circling through the trees. The snow makes the world seem so clean. There are only tracks and a few bits of lichen and broken twigs. Do you have any idea who might have done that to the poor fishy? That fish was already good and dead. I wouldn’t put it past an eagle to clean up the mess.